The nine lakes of the Harris Chain total approximately 76,000 acres. Twenty years ago these lakes hosted numerous national bass tournaments including the B.A.S.S. Megabucks. Around 1990, B.A.S.S. held a disastrous national tournament on the Harris Chain, setting a record for the lowest average catch rate of any national tournament. This tournament created ripples throughout bass fishing circles, eventually culminating in the publishing of an article in the December 1992 issue of “Bassmaster Magazine” detailing many of the problems. The causes for the decline were reported as; over enthusiastic weed spraying, locks, mysterious bass viruses and a dozen other causes. Whatever the cause, it was clear that bass fishing in the Harris Chain had significantly declined from previous levels. What is not generally known is that these lakes have recovered substantially during the past 5 years. Knowledgeable local anglers now produce excellent catches of bass on a regular basis. Captain Mike Antley has conducted a weekly tournament on the Harris Chain every Sunday for over 10 years. Analysis of his records over the last five years show these waters to be very productive, producing 5 fish tournament limits of over 20 pounds on a regular basis. Nine, ten and 11 pound Trophy Bass regularly anchor most of these catches. The reasons for the recovery of the Harris Chain bass fishery are easy to identify. In the early nineties, Florida implemented a five bass 14″ daily limit that went a long way to improve the overall success of Florida bass anglers. Catch and release caught on with anglers and guides. In 2001-2002 a severe drought created an artificial draw down that re-grew miles of eelgrass, pads and shoreline cover. During the drought, game officials and local residents also replanted acres of beneficial reeds in large areas of the Chain. Water levels have now returned to normal and the Chain is producing good numbers of Trophy Bass. 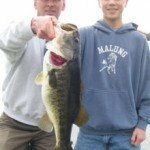 Many 10 and 11 pound Trophy Bass are caught each spring along with an occasional giant in the 12 to 13 pound range. The Harris Chain of lakes are extremely fertile and contain mostly dark stained water. The primary cover is Kissimmee grass, eel grass, lily pads, reeds and bulrushes. There is some very clear water, but it is limited to the backs of residential canals and in the spring creeks that feed the lakes. If you are fond of fishing light tackle in crystal clear water, you will have quite a shock in these waters. These are Trophy Bass lakes with strong healthy bass, requiring stout tackle and power techniques. Finesse tactics work well in these lakes, but you take your chances of breaking off a nice Trophy Bass. There are generally two separate distinct patterns to Harris Chain bass fishing; main lake fish and canal fish. The seasons and the weather dictate which pattern is best for a particular time. As a rule if one doesn’t produce, the other does. The following maps and information will provide you with a basic overview of the Harris Chain of Lakes. Clicking on the small map pictures will display a larger map. Big Lake Harris is just what it’s name implies, Big. At over 15,500 acres, Big and Little Lake Harris combined are among the largest lakes in Florida. Big Lake Harris’ average depth is much greater than Lake Okeechobee to the south with many deep holes and ledges. The lake is surrounded by beautiful hills and cypress trees. This is the part of Florida some Orlando residents call “The Mountains”. Local humor to be sure, but compared to the rest of Florida which is flat as a pancake, it is very hilly. There are three public launching ramps on Big Lake Harris; off of US Highway 27 to the west, Venetian Gardens in Leesburg and Hickory Point near the Howey bridge off State Road 19. There is a small but serviceable ramp located on the east side of Little Lake Harris in the City of Astatula. The lakes are almost totally ringed with Kissimmee grass and reeds except for the occasional boat dock or seawall. The depth in the grass normally ranges from 2-5 feet. The bottom is mostly hard sand except for some shallow marshy areas where the bottom is soft mud. Excellent bass fishing can be found in the Ninth Street canals and in the Dead River. These areas also offer a good place to fish during inclement weather. Until recently, water skiers and jet skiers have mostly avoided these lakes. In the last 5 years, the lakes have cleaning up considerably bringing more boating activity. Still, it’s a fraction of the traffic found on most Orlando lakes. Lake Eustis covers 7,806 acres and is connected to Big Lake Harris through the mile long Dead River and Lake Griffin through Haines Creek. Both Haines Creek and the Dead River have excellent Bass fishing in season. Surrounding Lake Eustis are numerous residential canals which at certain times of the year can be very productive. It is also the home of the famous “Gator Hole”, a deep sink hole at the end of a natural canal leading off the main lake. This hole produces scores of Trophy Bass and can produce the Trophy Bass of a lifetime if you are there at the right time. For most of the year the canals produce the most consistent action in Lake Eustis. There are two public boat ramps on Lake Eustis. The popular Buzzard Beach ramp is located between Tavares and Leesburg on State Road 441. The Eustis city ramp is located on Lakeshore Drive just south of the City of Eustis. Together, the East Harris Chain lakes; Dora, Beauclair and Lake Carlton cover 4,475 acres. They are connected to Lake Eustis on the north through the Dora Canal and to Lake Apopka to the South through the Apopka Beauclair Canal. During the recent drought, Game Officials and local anglers planted a considerable amount of new reeds in these lakes. These reeds are now flooded and have begun to fill in the shore line. is traditionally the first to turn on in the spring and seems to hold bigger Bass than the rest of the lakes. Again, Kissimmee grass, reeds and bulrushes are the predominate cover. The boat docks in this lake, especially along the north shore can be very productive during the middle of the day. South of Lake Dora is Lake Beauclair and tiny Lake Carlton. Lake Carlton can be reached through a small inlet on the southern shore of Lake Beauclair. Both of these lakes are known for Trophy Bass. 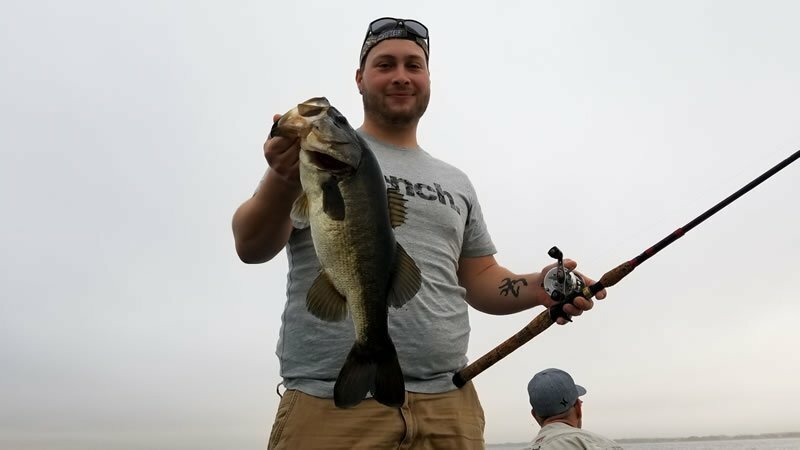 Most of the big bass are caught by flipping and pitching the boat docks and reeds but local anglers have placed brush piles in these lakes and many tournaments are won by fishing these “secret” holes. The Apopka Beauclair Canal system is a sizable area of clear water that holds bass year round. The entrance to these canals is located near the southwestern shore of Lake Beauclair. There is a lot of water to be fished and it is all excellent at times. The so-called “Clear Canal” is located here, which is a major sight fishing area in the bedding season. Many tournaments have been won in this area for those willing to make the long run. 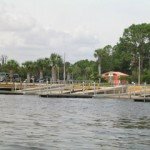 There are three public boat ramps on the East Harris Chain lakes; two on Lake Dora and one in the Town of Lake Jem. The Lake Jem ramp is on the Apopka Beauclair canal. Lake Griffin on the end of the Chain, is the last major body of water before the Ocklawaha River turns north and flows through the Ocala National Forest as it winds towards the St. Johns and Jacksonville. Until the late eighties, Lake Griffin was one of the best bass fisheries in the State. A host of problems contributed to the collapse of the fishery around 1990. A major contributor being the over application of herbicides which killed all of the offshore cover. Bass fishing remained poor until a 2 year drought lowered lake levels and allowed new weed growth to take hold. In addition, restoration efforts in the form of shad removal and run-off controls are starting to have a healing effect on the lake. At this time, good catches of bass are occurring as eel grass, Kissimmee grass and hydrilla return. The water quality has greatly improved and we expect the lake to be an excellent fishery as restoration efforts continue.